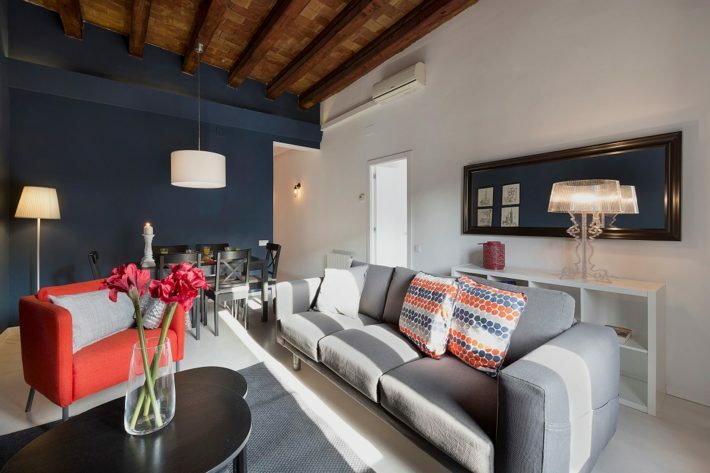 Cute and charming Alaia 42 is the first featured apartment of 2019! 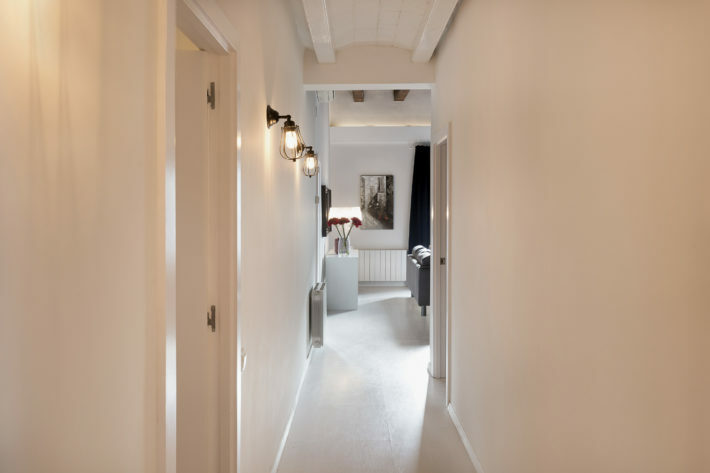 Sometimes less is better, and that is the case this time, as the apartment is minimal, but fully equipped and can offer everything you might need during your stay! With a spacious living and dining area, 3 bedrooms, a bathroom and a cozy yet fully-equipped kitchen, the apartment covers an overall area of 80 m2. Alaia 42 can comfortably accommodate up to 5 people in two double bedrooms and a single one. Possibility to crash the sofa makes it 6 then! After preparing a lovely breakfast in the fully-equipped kitchen, enjoy it in the relaxing living room with a dining table for 6 of you! 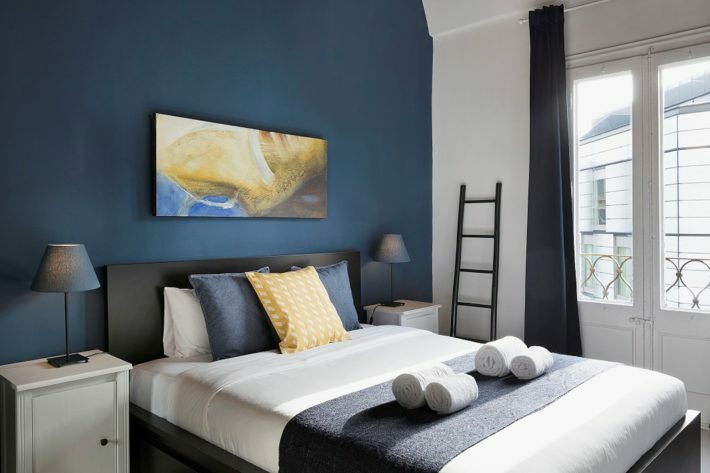 The place has quite a cohesive style – minimal, elegant, with blue splashes of color here and there. The blueish decor of the place will give you anything but blue mood throughout your stay, believe me! Alaia 42 ticks the box location-wise. It can be found in Eixample area, which is famous for its’ grid pattern of the streets, original facades of each building and is filled with anything you could possibly desire – traditional restaurants and tapas bars, foreign cuisine places, art galleries, most famous sights in all Barcelona, boutiques and famous clothes stores. Lively and diverse spirit is inseparable from Eixample. Do the nicknames “Gaixample” and “Beerxample” prove my point? 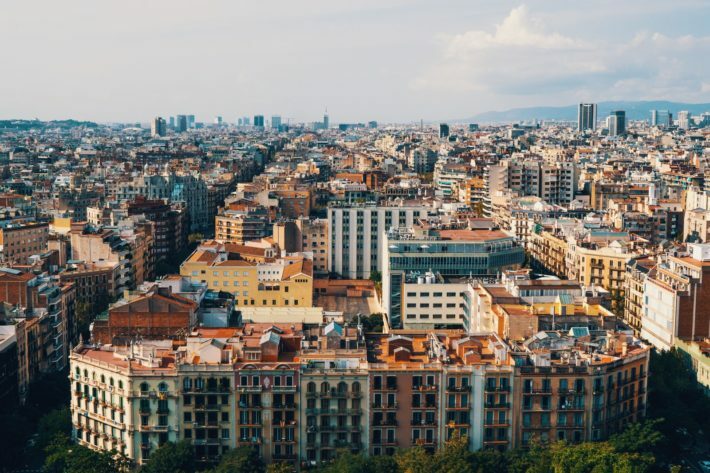 Metro lines L2, L3, L4, and L5 pass through two metro stops nearby (Diagonal and Passeig de Gràcia), both of them are easily accessible in just a couple minutes walk – connection to the rest of the city on point! La Pedrera – 0.47 km. La Pedrera, which is also known as Casa Milà, became a World Heritage site by the UNESCO in 1984. This is the building Antoni Gaudí worked on before he completely dedicated himself to the Sagrada Familia. Casa Batlló – 0.64 km. Another Modernist gem in the city – Casa Batlló. It was built in 1877 and almost thirty years later restored and remodeled by Antoni Gaudí and Josep Maria Jujol. Paseo de Gracia – 0.68 km. Paseo de Gracia is one of the most famous streets in Barcelona and is a favorite of tourists as it contains everything from local architectural treasures to clothes stores.